Dr. Hagge was born in Hibbing, Minnesota, he is a 1980 graduate of Pacific University in Forest Grove, Oregon. He moved to Eagle River in 1982 and opened the Chugach Eye Clinic shortly after. He has enjoyed serving this community for over 37 years. He is a member of the Alaska Optometric Physicians Association and the Chugiak/Eagle River Chamber of Commerce. In his spare time he enjoys hunting, gardening and cheering on the Minnesota Vikings! Evie and Andrea, our front office staff, will always greet and assist our patients with the highest level of friendly customer service! They both do an outstanding job assisting Dr. Hagge with pre-screening tests and scheduling appointments. Our office manager, Jean who has been with Dr. Hagge the last 19 years, oversees the business end of our clinic. All of us are willing to answer any questions regarding billing insurance, contact lens fitting, as well as other services we provide.We enjoy visiting with all our loyal patients, in fact, we treat everyone as we would like to be treated ourselves! 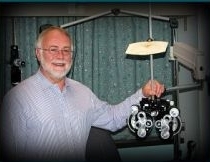 "Alan is our Optician and all around expert. He is very knowledgeable and experienced when it comes to frame selection, lens types and repair. He has been known to go that extra mile when repairing a patient's broken glasses to helping them find a frame that is a perfect fit. Alan began his optician career in 1983 when he moved to Alaska from Oregon. He has been an employee at the clinic since 1996. Alan says, "The sign on my wall says it all, 'Born to Fish Forced to Work!'" Stop by for a glasses adjustment and to hear the latest fishing or hunting tales!